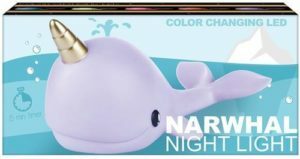 For a limited time, this Narwhal Color-changing Night Light is only $9.60 + free shipping! The regular price is $16! This would be so cute in a child’s room or even a bathroom! This narwhal night light makes for great room décor during the day AND at night! During the daytime hours, this purple cutie with a golden horn can hang out on your nightstand looking cool. At night, flip it on to fill your room with color-changing LED light. This super cute light will provide all the comfort that your little one will need. This wonderful smiling narwhal night light will illuminate a bedroom with enough light to comfort your little one as it gradually phases through a range of colors including reds, greens, pinks, blues and purples. Use this night light instead of switching on the main lights. Children use them because they can be afraid of the dark. 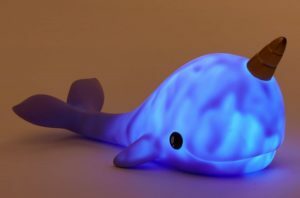 What better way to make them feel comfortable than with a soft glowing narwhal night light? Color changing warm glow effect. Hurry over here to pay only $9.60! Shipping is FREE!